What role does the written language play in the development of attitudes toward the environment? Is it mere coincidence that Australia – with its appalling extinction and land degradation record – is a nation with low levels of nature literacy? A largely urban and coastal people, we seem happy to acquiesce to glib views about Australian nature, settling for the “wide brown land” over more nuanced understandings. Could the way we think and write about nature become a catalyst for changing our attitudes toward the environment? The European appropriation of Australia coincided with the Romantic Movement, a literary and artistic development that lasted from the late 18th to the mid 19th century. As the First Fleet set sail, William Wordsworth was wandering lonely as a cloud and Wolfgang Amadeus Mozart was completing Don Giovani. The ideas of the Romantic Movement grew out of revolution and nationalism, and included a strong reaction against rationalism and industrialisation. As a consequence writers and artists were drawn in a new way to nature and landscapes. It would be easy to underestimate the impact of the Romantic artists. It is unlikely, for instance, that Wordsworth could have anticipated that his writings would lead to the establishment of national parks. Yet such a consequence can be traced from the growth in nature-consciousness – this “new” way of looking at landscape – not just in his beloved Lake District, but as far afield as the United States. Words such as sublime and picturesque were applied to landscape for the first time, and the desire to protect and preserve such places from newly rampant industrialisation grew strongly. The Movement also effected mainland Europe. An instructive example is the establishment of an independent Norway. The Scandinavian nation’s break with first Denmark and then Sweden was very much influenced by Romantic notions. As 19th century Norwegians searched for ways of establishing their own national identity, they turned to their landscape – the mountains and fiords – to distinguish Norway from its flatter, forested neighbours. A new wave of nationalistic literature celebrated Norway’s own landscape and lore. Nationhood and nature; literature and cultural self understanding became deeply intertwined. Meanwhile what was happening in Australia? During this same period the British were struggling simply to survive their first decades in New South Wales and Van Diemens Land. By the time they’d gained any sense of security, let alone prosperity, the Romantic Movement was already on the wane. The urge for nationalism, which might have spurred a cultural self-understanding based on our own physical environment, was past. Instead the European Australians camped on the land as exiles, attempting to assuage their homesickness by creating an antipodean England. This made them more inclined to exploit the new land than to love or understand it as it really was. But if that boat was missed, did all chance of an environment-based self-understanding leave with it? Is there no way that we can re-invent our self-understanding so that Australia’s unique and diverse natural environment is better incorporated? In true Romantic fashion, I decided to travel to the wilder parts of the UK, Ireland and the USA seeking possible answers. Could the roots of British and American nature writing provide clues as to how Australians might grow their own nature literacy? I found much to encourage such a quest, but also cause for caution and further thought. Though my findings are selective and somewhat anaecdotal, this too seems appropriately Romantic. In Scotland my visit to the Isle of Skye was greatly enlivened by reading the late Gaelic poet Sorley Maclean (in translation). Here was a modern poet of place, writing for and about his own small group of Scottish islands, which are dominated by the Cuillins, two prominent sets of mountains. Strikingly Maclean uses “Cuillin”, among other place names, as a metaphor for beauty. When I asked myself whether Australians would easily use a geographical point as an adjective of adoration, I could only conclude that any “Kosciuzko of my heart” would be met with derision! Yet this was the first lesson of my travels. Deep connection to place may best be expressed in language derived from the experience of that place – in short an endemic language. While still in the highlands of Scotland I had the opportunity to canoe the Spey River with a group of Scots over several days. As we progressed from mountain to sea, I began to see and hear things that made me aware of the different ways in which Australians and Scots see the natural world. But it was a conversation with an old Scot in Grantown-on-Spey that crystallised one of the key differences for me. In explaining that he wasn’t born where he now lives, the old man said simply “I belong to Wick” (a town in the far north of Scotland). Whatever deep sense of belonging Australians may have, they would not express it in that way. I, for instance, would never say “I belong to Tasmania”. Yet many Scots that I met showed this kind of deep attachment to their town or district. And this attachment comes through in conversation, in music, in story and in the deep Scottish fascination with history. This was the second lesson: Authentic cultural expression – including a vibrant nature literacy – may need to grow out of a deep and prolonged sense of belonging to place. This was also the first warning sign in my quest. Is there any way that such a sense of belonging can be hurried? Must white Australians inhabit this land for many more centuries before they belong? Some Indigenous Australians believe this to be the case, and certainly white Australians have much to learn from the first Australians in terms of understanding the country. At the least I see an orange light against any easily gained sense of belonging. On the other hand, who can tell the heart it doesn’t belong when that sense grows within? To quote another Scot, singer Dougie MacLean, “you can’t own the land, the land owns you”. In Ireland there was ambiguous evidence on this issue of belonging. On the one hand I was struck by the nature writing of two expatriate Englishmen now living in the west of Ireland. There could hardly be two people more deeply immersed in place that Tim Robinson and Michael Viney. Robinson’s remarkable books about the Aran Islands – “Stones of Aran: Labyrinth” and “Stones of Aran: Pilgrimage” – are extraordinary for their detailed evocation of both place and the past. Robinson lived for many years in the Aran Islands and, “outsider” or not, there would be few in Ireland who would deny that he has caught the essence of that place with extraordinary skill. The fact that Robinson is also a cartographer who has produced what many see as the definitive maps of the Aran Islands further attests to his devotion to place. The other case that dilutes the argument for endemism in these matters is Mayo-based naturalist and writer Michael Viney. I was privileged to visit Michael Viney at his remote west coast home. The author of a “A Year’s Turning”, a nature diary of a year in the Irish countryside, Viney also writes a weekly nature column, and contributes to numerous natural history publications and television programs. The most pertinent lesson of my meeting with Viney was to note the degree of his dedication to finding out every possible detail of the natural history of Ireland. After some 30 years in Ireland, he has become one of the most sought-after authorities on Irish natural history, even if some of the locals still see him as an Englishman! The book-lined interior of his home attests to his strong desire to follow-up his frequent fieldwork with careful reading and study. From these two examples I took another lesson: Obsessive curiosity about, and dedication to, a place or subject can outshine the contempt of familiarity. strongly among those born there. While preparing to explore the hills and bogs of Connemara, I came upon Seamus Heaney’s poem “Bogland”. It captures superbly that sense of long human attachment to place. Reflecting on this as an Australian in Ireland, I felt a compulsion to acknowledge – almost an urge to boast about – the vastly greater timespan of Aboriginal occupation in our country. Yet that raised again a personal sense of both indebtedness and sorrow in relation to our Indigenous people: indebtedness for their long stewardship and intimate knowledge of the land, and sorrow for white Australia’s treatment of Aboriginal Australians. It is hard to see a way forward, not just socially, but in terms of our broad cultural self-understanding, that rejects a full accounting for our past. This was the next finding: That there is no going forward to new ways of understanding our natural environment without an open-hearted accounting for past wrongs, both historical and environmental. During my brief time in the United States, I had a more purely interpretive encounter in the tame wilds of Vermont’s Green Mountains. It opened a small window on how interpretation and nature literacy might go forward together. Robert Frost was an unofficial poet laureate of 20th century USA. 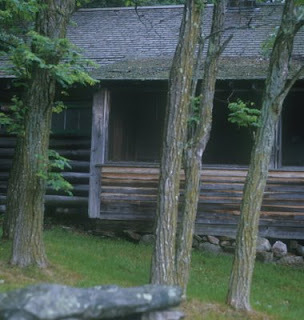 A teacher at Middlebury College in Vermont, he used to take a “road less travelled” and retreat for long periods to a cabin in the backwoods of the Green Mountains. There he would muse and write, turning much of his inspiring surroundings into memorable verse. Of course fame has long since caught up with the great dead poet. Interpretive trails have become a part of the on-going merchandising of Frost. The local Forest Service has a “Frost Trail”, and panels of his poetry pepper the countryside. However the back-country cabin that he used to frequent has mercifully – even miraculously – escaped this attention. I had a memorable time exploring the outside of this almost un-signposted cabin, and wandering in the woods that still surround it. My hosts and I finished the visit by reading aloud several of Frost’s great poems, including “The Road Not Taken”. It was a far more powerful experience than any sign-posted interpretive walk or visitor centre might have offered. Here then was the final finding: What we say or write about nature or culture must never replace the genuine experience of nature or culture itself. This paper’s aim was to contribute to the growth of a new Australian nature literacy. Because interpreters use language – written and oral – as a tool, we are automatically among those at the front line of cultural selfunderstanding. If we also interpret nature, we add to that the chance to be leaders in generating nature literacy. · Willingness to reconcile our past with our projected future. Bate, J. (2000) The Song of the Earth, Picador, London. Heaney, S. (1998) Opened Ground: Poems 1966-1996, Faber and Faber, London. Maclean, S. (1976) in Modern Scottish Gaelic Poems: A Bilingual Anthology, Edited by D. MacAulay, Cannongate, Edinburgh. Robinson, T. (1990) Stones of Aran: Pilgrimage, Penguin, London. Robinson, T. (1997) Stones of Aran: Labyrinth, Penguin, London. Viney, M. (1996) A Year’s Turning, Blackstaff, Belfast. This is just the right piece to read after the Half Open Door writing I read yesterday. My foray into Nature Writing as seen through your eyes continues to send me to interesting and thought provoking places. For example, I am fascinated to consider that it was probably more than white Australia's tough beginnings that have set us on the 'log it, shoot it, dam it' path we are all to familiar with. Maybe we're entering our own Romantic period now?